On August 5, 2018, upwards of 1000 people assembled in Berkeley to march on a planned white supremacist fascist rally. During its attempt to reach the “alt-right” rally in Martin Luther King Civic Center Park, the march repeatedly encountered heavily defended police barricades that prevented them from entering the public park. After several attempts to reach this location, dozens of people brought barricade material to the front and gathered over twenty feet away from the police line. Without any provocation, the Berkeley Police Department began firing on the crowd with a variety of projectiles. In response, the front of the march began to hurl their own variety of projectiles. This is not the version of reality currently being presented by the BPD. 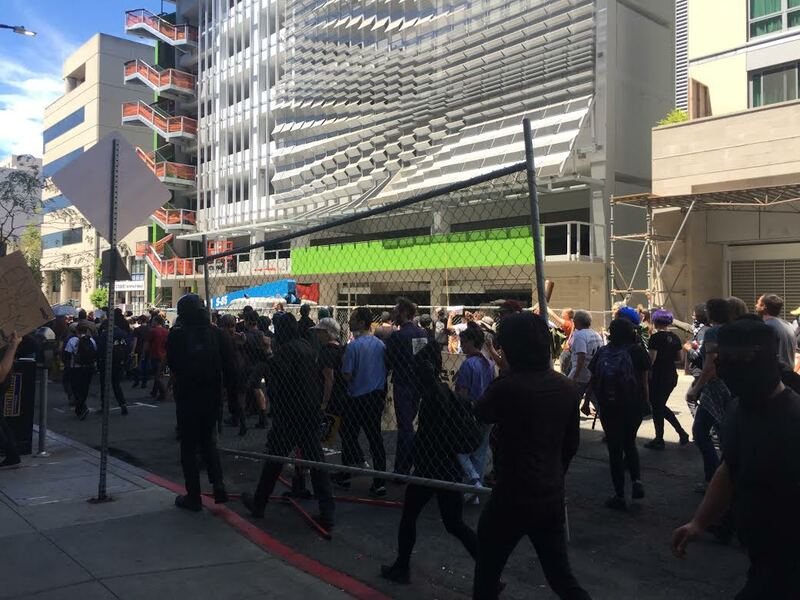 After being fired upon, the anti-fascists continued to march through downtown Berkeley. Several City of Berkeley cars, a Marines recruiting center, and a bank had their windows smashed to highlight their complicity in supporting fascism, whether at home or abroad. At one point, a fascist began to approach the march but promptly ran away. The overt state strategy of favoring fascists over the much larger anti-fascist contingent is a rising trend in numerous police forces. The cities that allow these police to implement their racist agenda of attacking anti-fascism and protecting the rather pathetic, tiny gatherings of the alt-right are guilty of direct collaboration with the fascist resurgence. This goes for “liberal” Berkeley just as it does for “green” Portland. This state strategy must be exposed and thwarted immediately, given the gravity of the situation. All out to defend the 17 arrested in Berkeley. No one gets left behind.